In 1938, the American geologist Max Steineke discovered oil reserves south of the city of Dammam in eastern Saudi Arabia, at a depth of 1,440 meters. The reserves turned out to be the biggest in the world. Giant pumping and refining facilities appeared around Saudi Arabia, which became an oil power able to dictate the global agenda. 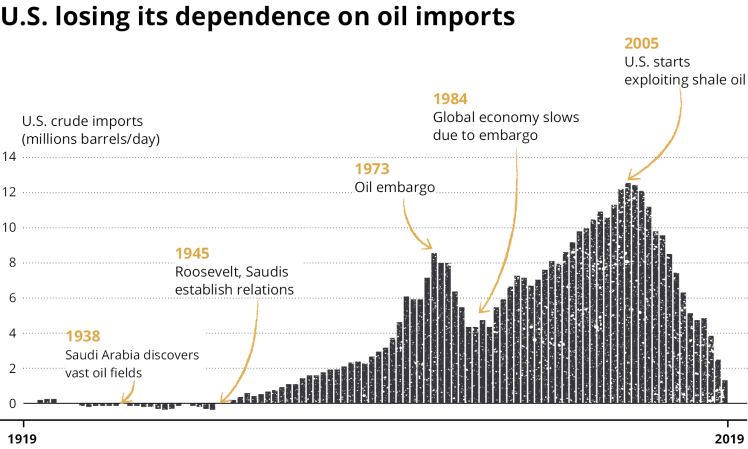 Down the decades, oil seemed to grant Saudi Arabia unassailable status. But now the U.S. is changing the rules. Eight decades after the dramatic discovery, the sun is setting on Middle East dominance over the global energy map. Saudi Arabia is in the midst of change. Its rulers have realized that the black gold which gave it international leverage for decades is a double-edged sword. The reason is simple: The Saudi economy is based mainly on oil and the kingdom sharply feels any decline in the scope of commerce or a big drop in oil prices worldwide. Crown Prince Mohammad bin Salman, who has recognized the problem, said that the country must be weaned off crude oil. According to OPEC, the organization of oil-producing countries led by Saudi Arabia, in 2017 the kingdom produced 13 percent of all of the world’s oil, a market slice similar to Russia’s. That same year the United States, Iraq and Iran produced 12 percent, 6 percent and 5 percent, respectively. OPEC countries hold most of the world’s oil reserves, which gives a clear and significant advantage to Saudi Arabia. But the 2017 figures don’t reflect the situation in the past. In the middle of the last decade Riyadh produced almost twice as much oil as the United States. Over the years, Saudi oil dominance has manifested itself in American dependence, which had its roots in the post-World War II period, when the U.S. began rapid industrialization and economic growth. 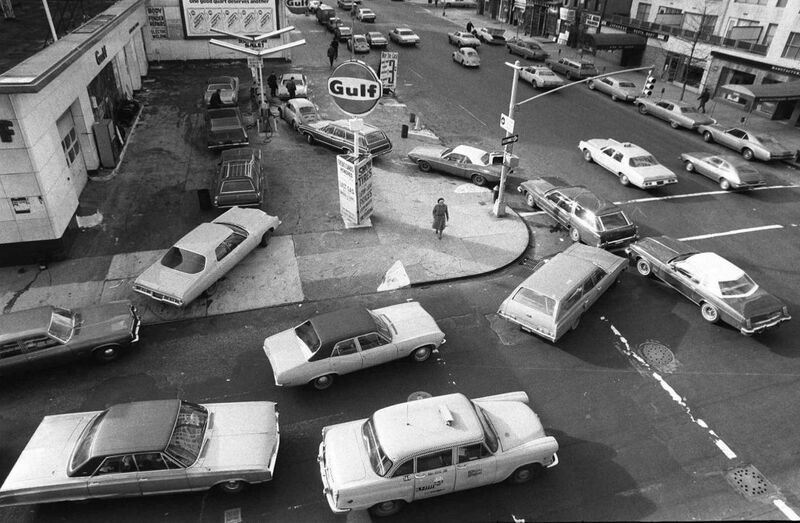 The energy crisis of the 1970s highlighted Saudi oil power more than anything else: After the 1973 Yom Kippur War OPEC declared an oil embargo on the United States and the cartel’s gradual cutback on production led to a global recession. That crisis also marked the beginning of the end of Saudi energy dominance. The embargo was a wakeup call for the West, which realized that oil dependence is a heavy and dangerous burden. Many counties began to think about the geopolitical implications of oil consumption. At the same time, the environmental repercussions began to appear in the public discourse. In 2005 something changed. Fracking – a technology that allowed the United States to efficiently produce oil from shale rock – launched a revolution that has undermined total Saudi control of the oil spigots. The higher the oil price when the Saudis turn off the tap (or in case of an occurrence beyond the United States’ control), the more it pays for the U.S. to produce oil from its own shale. The Permian Basin in Texas, where much of the drilling takes place, has become a world oil regulator – a role previously held by Saudi Arabia. Saudi Arabia has long been aware of the change. While it can’t stop the U.S. march toward energy independence, it can transform itself. And so in 2016 Salman launched an ambitious plan. Dubbed Vision 2030, its goal was to fundamentally change the Saudi economy and diversify its sources of income. To this end, the crown prince started to reorganize the kingdom’s government investment fund, invite more foreign workers into the country, develop service industries and – the greatest step of all – privatize the government oil corporation Aramco. But less than two years after the project was launched, Riyadh canceled the Aramco public offering. Saudi citizens are now discovering that they have to pay higher taxes, and that electricity and fuel prices have gone up. Economic stagnation has caused retail chains to shutter hundreds of stores. As part of the reforms, and to fight an almost $100 billion deficit, Saudi Arabia imposed value added tax beginning January 2018. The kingdom also halted a few particularly costly projects, cut bloated ministerial salaries and froze government employees’ salaries, which were previously subject to regular raises. But the kingdom was meanwhile investing billions in other countries, among them Pakistan, India and Egypt. Saudi Arabia was used to living off of oil, and like other countries who declared their desire to vary their sources of income for similar reasons, it is having trouble meeting its goals. Saudi Arabia has found one small ray of light in a world power to its east. Chinese President Xi Jinping has sped up China’s involvement in the Middle East, promoting commerce and investment and strengthening diplomatic and military ties. Today China is the number one importer of Saudi oil, which it needs to fuel its burgeoning economy. In 2016, 13 percent of all Saudi export went to China; 11 percent went to India and 10 percent to the United States. But just as oil was a double-edged sword for Riyadh, so are its economic ties with China, which does not hesitate to wield its purse like a big stick. When China had a disagreement with Saudi Arabia over the price of oil in May 2017, Beijing temporarily cut oil imports – but still paid the kingdom part of the previously agreed-upon amount. This affair represents the emerging new reality: Saudi Arabia may have controlled its clients imperiously in the past, but now it finds its fate increasingly in their hands. Oil has lost some of its leverage and Saudi Arabia’s impact on the world has changed accordingly.